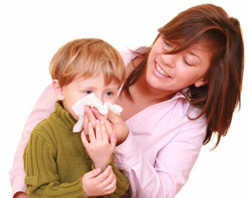 An allergy is an immune system disorder triggered by allergens. It is a form of hypersensitivity, which can be triggered by airborne particles, food, medications, or insect stings. The tendency to develop allergies is inherited from parents. Allergies can become apparent at any age. Airborne-induced allergies affect the eyes, nose and lungs. Symptoms include itchy and red eyes, sneezing, runny nose, coughing and wheezing. Allergy from food or medication can induce gastrointestinal symptoms, itchy skin and rashes. Allergens that come in contact with the skin can produce dermatitis, eczema, and hives. Allergies can also play a role in asthma. Contact Dr. Ellen Epstein to schedule an appointment to evaluate your allergy.